Given that Alembic has captured roughly same market share for Abilify as done by Torrent (as per various reports) and if we use same back of envelope calculation as used for calculating the revenue for Torrent from Abilify, then it will translate into roughly 200 MUSD sale coming from Abilify in FY16 for Alembic. Assuming a 60-40 split with their partner, it will translate into 120 MUSD contribution in topline from Abilify to Alembic for FY!6 and a roughly 80 MUSD to bottom-line (based on blockbuster Q1 result of torrent and in case of Alembic they are sourcing API inhouse as per conf call). This contribution from Abilify in itself will be almost twice the PAT which Alembic earned for FY15 and on top of that we have their base business, contribution from Celebrex (which is also a big molecule) and guidance from company of 7-9 launches every year in US. My guess estimate is that the FY16 EPS will be 40+ but that includes one off from abilify but they have robust product pipeline as highlighted by Ankit and should be able to sustain decent CAGR on base business as well. All these are rough calculation and Q2 results will give how much we are correct. Alembic Pharma management had mentioned in Jan14 VP Q&A that setting up front end in US is their next challenge. As per the last concall, typical model with US partners is 50:50 profit share. Thats a huge draw down for the company. Their margins are heavily impacted due to this. They said their front end will be operational in FY17. So till then the performance would not be spectacular. I want to understand how can Ajanta have so much better margins than Alembic. Any pointers? I dont know whether this has already been discussed. Ajanta always has their own front end, that could be one reason. But apart from that, can one say that their product identification capability is better than Alembic? Or probably the best? @singhvir…thanks for the calculation. I would assume the “typical 50:50 profit split” as management commented in concall. But even assuming an EPS of 30, it looks cheap on fwd basis. gAbilify to improve free cash flow in FY16 says icicidirect latest report on alembic. Alembic daily chart shows a possible breakout from pennant. attached chart and explanations on chart. Zolmitriptan (gZomig) is used in the acute treatment of migraine attacks. The patent expired in 2012 and has lot of competitors like Sun, Glenmark, Mylan and Teva already present in the market. Seems to be a ‘me too’ kind of product. It had US sales of USD 163 million pre generic. @pikrohit … In my mental model the EPS of 30 for FY16 is given (though we can’t take anything for granted till it actually gets reported ), what I will be looking on EPS front is that how far on north or south of 40 they will end up, the Q2 results should be able to give a good idea about this. What is working in favor of both Alembic and Torrent now is that they were slow and probably late to make entry into US and historically their US business has been small and that has set up a small base. e.g. US revenue of torrent were 134 MUSD and Alembic had international generic (inc US) revenue of 80 M USD for FY15. Now revenue from single molecule (Abilify) in FY16 will most likely exceed their entire full year FY15 revenue from US generic and will give a big swing to both topline and even more bigger swing to bottomline as contribution to bottomline will be much higher due to lesser price erosion in Abilify because of limited competition compared to a normal generic. On top of abilify we will have Detrol and probably Nexium for Torrent and Celebrex for Alembic plus a robust base business from India and other molecules from international generics. At a molecule level abilify is a one off opportunity but at the company level both Alembic and Torrent have good product pipeline which can provide similar upside giving decent overall CAGR even after considering abilify effect. Another company in similar situation is Cipla where a single molecule (Nexium) in US has provided a huge upswing to both top line and bottomline (despite Cipla having a much bigger size) as is evident from Q1 results. Is this kind of news might impact FDA body towards future approvals and stringent scan on the current products currently being shpped? I see Althrocin in the not-so-good-quality list shared by @wpf123 . This one generates 7.4% of Domestic formulations sales. Not sure if the liquid version mentioned in the list is different from the one in this chart. Anyways, i don’t see any other big pharma companies name in the not-go-good list. Now “Aurobindo Pharma receives USFDA Approval for Aripiprazole Tablets”.Impact of Increasing competition will be interesting to see in next Q results. It is a Channel BO also. Sorry was late in posting this chart. 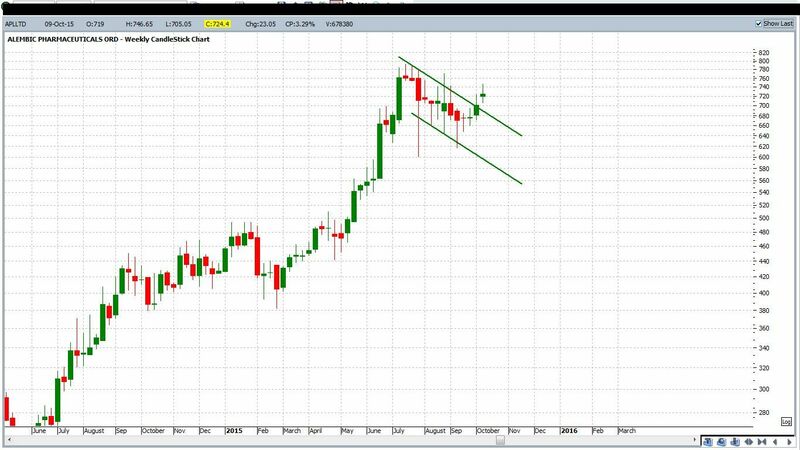 As long as the upper channel intact, the uptrend will continue and a buy every dip till that line. Super duper Q2 FY16 results. Orbit changing. the management didnt disclose the contribution of Abilify in Q2. They have lost market share in Abilify in last 2-3 months. They reached 10% market share but now its down to 6%. The management said there has been drop in prices of Abilify after the entry of Apcotex and recently after the entry of Aurobindo. R&D expense in H1 FY16 is around 158cr (disclosed in the investor presentation). The management is guiding for R&D expense of 250 cr in FY16. The company plans to launch 6-8 products every year for next 2-3 years in US. Q2 FY 16 doesnt include any contribution from gCelebrex. It is launched through partner in US and its contribution will be reflected in Q3 FY16. -There were some one -off expenses in 'other expenses" (like litigation costs) in Q2 but management didnt quantify the one off exp. alembic q2 fy 16 results seem to be better than expected. What is more encouraging is the amount of R&d spend. Market reactions can be well wide of our expectations in the short term. e.g One can see the torrent stock price after stupendous q1 fy 16 results. and after a few trading sessions it was business as usual. With some guys I talked to after results, the big question is what would be normalised earnings in absence of abilify kind of revenues in fy 17. My take is that one can start off by calculating a calibrated growth from eps figures of 15 in fy 15 and put in a 25-35% growth depending upon one’s bullishness. And with the kind of pipeline alembic has there can be a few other blockbuster opportuniites. And going ahead with its own marketing network, it can milk the opportunity if and when it comes fully. Another thing they could do would be to sell some existing molecules thru its own marketing network and thus improve margins further. Launch of front end: The company launched its first product gNamenda (Memantine Hydrochloride) through its own front end in USA. The good part is for the remaining 27 ANDAs pending approval, apart from 4 - 5 rest would be marketed through their own front end. I think many of us had concerns over company doing all the hard work in R&D and then faltering in the execution - as we have seen some loss of market share in gAbilify & Pristiq 505 (b) (2) is going to be addressed through launch of own front end. R&D: The R&D expenses for the full year are expected to be around 250 crore (this quarter it was around 90 - 95 crore including capitalised R&D cost) and going forward they would be around 8 - 9% of the revenues. The company filed 3 ANDAs including Warfarine 505 (b) (2) (although with a partner). The company seems to be working on complex projects in derma and injectables. Even in 27 ANDAs pending approval, many are FTFs and Para IVs. The company got approval for 2 ANDAs in the quarter and launched 1 (gCelebrex with Trigen as the partner) recently. ANDA Pipeline: The company expects to file 8 - 10 ANDAs and expects to launch 6 - 8 products per year for next two years. For gPrisiq, the company has settled with the innovator (Pfizer) and hence did not indicate the launch date (it is expected around June - July, 2016). gAbilify: The company has lost some market share post entry of Apotex. The company did not indicate any guidance going forward but said that it will take time for market shares to settle for the product. The company receives remittances from the partner post lag of one quarter. With every new entrant, the price erosion takes place. Despite the loss of market share and price erosion, it continues to remain a very lucrative opportunity. Capex: The capex for the full year is expected to be around Rs.300 crore. For H1, they have incurred around 120 - 125 crore. Also, our tribesman Rohit Oza started the Q&A session. Great going. Yes I was surprised to get the first question. I thought everyone would anyway ask about Abilify, so asked some other questions. Q2 results capture the Abilify sales and profits of May and June. So the actual full quarter numbers will come in Q3 but as pointed out, the company has lost almost half of its share and some price erosion has happened. Of the approved ANDAs, company is in process of launching some products. Some may not be launched because their market doesnt look good. Abilify ODT has a small market size of 15-20mn, but Alembic is the only player. Pristiq is under settlement. Management declined to comment on the launch or partner. Management clearly said that for R&D spend they dont have a percentage of sales number in mind. they invest based on the requirements. The absolute spend on R&D will continue to grow. API numbers show a good growth but at plant level, activities are flat. In some quarters, captive use is more. In this quarter they clubbed some external orders so the recognized sales for APIs show an increase. Long term guidance remains 30-35% growth in international generics sales, 15% growth in domestic sales and margin expansion from 20% to 23%. I am happy to see the management walking the talk. 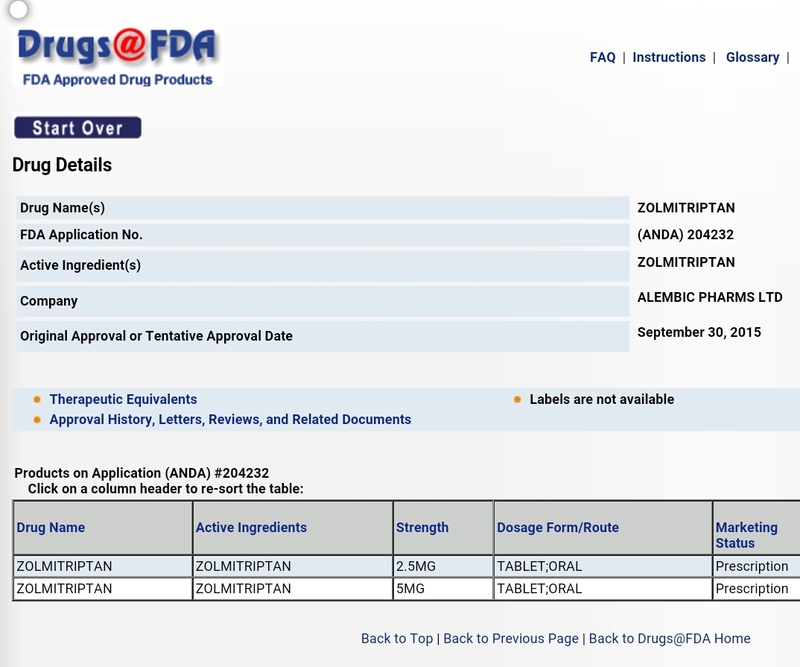 APIXABAN (gELIQUIS; innovator - BRISTOL MYERS SQUIBB [Pfizer is the partner in the US market] - Filed on September 30, 2015. Exclusivity Expiry - Dec 28, 2017 and Patent Expiry - Dec 22, 2019. gEliquis (apixaban) helps to prevent platelets in your blood from sticking together and forming a blood clot. Eliquis is used to lower the risk of stroke caused by a blood clot in people with a heart rhythm disorder called atrial fibrillation. Other DMF Holders - MSN LABORATORIES PRIVATE LTD, ZHEJIANG HUAHAI PHARMACEUTICAL CO LTD, DR REDDYS LABORATORIES LTD. Total sales US in 2014 - USD 404 million (424% increase y-o-y); USD 355 million sales (186% increase y-o-y) in H1CY2015 in US markets. Its a fast growing molecule with just four players who have filed DMF till September 30, 2015. AZILSARTAN MEDOXOMIL MONOPOTASSIUM (gEDARBI; innovator - ARBOR PHARMS IRELAND [marketed by Takeda in US]). Exclusivity Expiry - Feb 25, 2016& Patent Expiry - Jan 7, 2025. Azilsartan is an angiotensin II receptor antagonist used in the treatment of hypertension. On 25 February 2011, the U.S. Food and Drug Administration approved azilsartan medoxomil for the treatment of high blood pressure in adults. 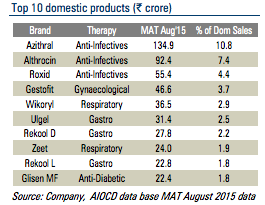 Other DMF Holders - MSN LABORATORIES PRIVATE LTD, HEC PHARM CO LTD, JUBILANT GENERICS LTD, ALP PHARM BEIJING CO LTD. US sales - USD 37 million (source: Bloomberg).